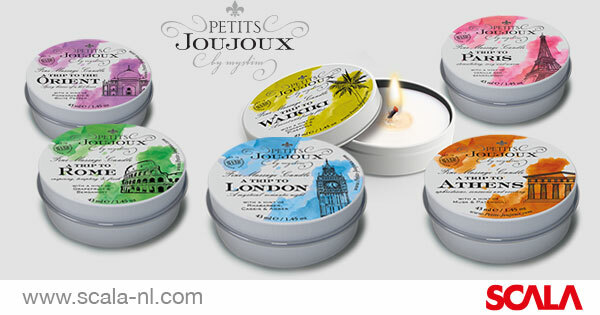 The Petits Joujoux massage candles by Mystim are now available at SCALA in a smaller, travel-friendly packaging. The new packaging contains five elegant, compact tins. The new massage products by Petits Joujoux offer the same scents in a compacter, travel-friendly packaging. The massage candles now come in a tin packaging with brighter, eye-catching colors to entice consumers for a closer look. Each box includes 5-pieces of a 45ml massage candle tin, offering a burn-time of 6 hours each. The scents have remained unchanged with six varieties to choose from: Paris, Rome, Athens, Waikiki, Orient and London. Each scent is inspired by the location it’s named after, for example: Waikiki, a tropical paradise in Hawaii, smells sweet and fruity, with a hint of pineapple and coconut.